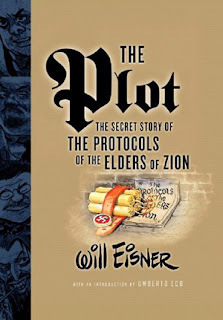 Will Eisner’s final graphic novel, The Plot: The Secret Story of the Protocols of the Elders of Zion, is an atypical book for the graphic novel genre. It was published after his death and may not have been fully completed. The best way to explain it would be to call it an “illustrated textbook.” There’s no real main character, apart from Eisner himself, who narrates some of the final portions of the book; instead, the book details the complex and convoluted history of the world’s most dangerous hoax through a variety of vignettes. As The Plot explains, a French author named Maurice Joly wrote an essay called “The Dialogue in Hell Between Machiavelli and Montesquieu,” intended as a critique of the despised French dictator Napoleon III. Decades later, a Russian forger found the “Dialogue,” copied parts of it, and changed the language. Instead of a political satire, it became the “records” of the supposed Jewish overlords who controlled the world’s governments. A lengthy segment of Eisner’s book places the text of the “Dialogue in Hell” and the text of the Protocols next to each other so you can see just how much was plagiarized. The influence of the Protocols spread from the court of the insane Tsar Nicholas II to the newsletters of the unhinged Henry Ford, eventually influencing the Nazis. Despite being thoroughly disproven as a hoax, the Protocols are still sold worldwide and were even adapted into a television series in the Arab world a few years ago. In the last portion of the book, Eisner documents the modern incarnations of the hoax, sounding more and more exasperated and shocked each time the Protocols are cited as the truth. In an almost comically tragic sequence, Eisner keeps declaring that the hoax could never recover from the burden of proof assembled against it, only to be proven wrong by the march of human ignorance. Eisner’s sense of design never faded, and The Plot frequently demonstrates his perfect use of extreme detail, empty space and everything in-between. Often, the backgrounds are lightly drawn in with just the right amount of shading. His figures always have interesting expressions no matter how minor the character. His lettering is a bit rough, and I do wonder whether Eisner would have gone back and redone some of the lettering if he hadn't passed before he completed the book. There are also some sections that are pure text and these, along with the wide margins, indicating that Eisner perhaps hadn’t progressed as far as he wanted. Adding to the textbook feeling of The Plot are the extensive notes and back matter. Eisner made sure to cite his sources, leading to two pages of references and a full three-page bibliography. It’s even introduced by Umberto Eco, a scholar who has done quite a bit of his own investigations on the Protocols. Eco’s praise for Eisner legitimizes The Plot and helps it transcend the “age ghetto” that often surrounds comics by older creators. The narrative resonates with me because of my Jewish heritage, but I can see where it might fall flat if you don’t know about the Protocols beforehand. Still, I think the outrage surrounding such a terrible hoax should be enough to convince readers to check out Eisner’s final work. While I can’t call The Plot Eisner’s best book, I can certainly label it as one of the most important. If you’re intrigued by this book and want to read something similar but with a stronger narrative bent, read Eisner’s Fagin The Jew. Thanks, Doug! Learn more about Will Eisner week at www.willeisnerweek.com.